Tornado’s Titan 2096-6 12.5g is a one-piece deer net; the 96” height of the fence creates a highly secure barrier; it is ideal for use in areas where deep snow or uneven ground may allow deer to jump over a lower fence, or where additional security is required. Tornado’s Titan 842-12 12.5g is a high tensile fence. 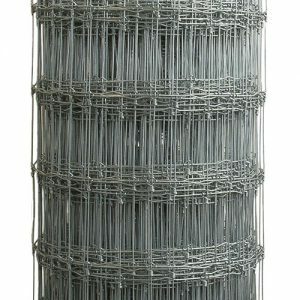 It features solid vertical wires for increased net strength making it ideally suited for containing powerful livestock such as cattle as well as goats and sheep. Tornado’s Titan 842-6 12.5g is a high tensile fence; its height of 42” and its solid vertical wires for increased net strength make it ideally suited for containing hogs or cattle. Tornado’s Titan 949-12 12.5g is a high tensile fence. 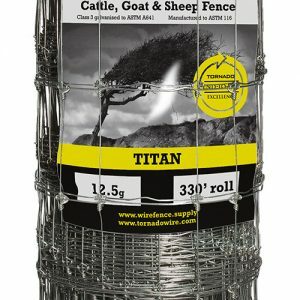 It features solid vertical wires for increased net strength making it ideally suited for containing powerful livestock such cattle as well as goats and sheep. Tornado’s Titan 949-6 12.5g is a high tensile fence; its height of 49” and its solid vertical wires for increased net strength make it ideally suited for containing hogs or cattle.